Congratulations to Adam Gold and Louis McPhee on being invited to participate in the table tennis national championships 2018 for U.10-U.13's. Both boys are pupils of Collis School Teddington Adam Yr 6 and Louis Yr 4 and show great potential for the the future if they keep focused on the sport and their training. Hampton and Tiffin Schools are not traditionally known for their excellence in Table Tennis. However after Hampton school won the Richmond Schools' title this year they went on to win the Plate Trophy in the South London Qualifiers. Tifiin School also did well in winning the Kingston Schools' title but went one better by narrowly beating Wallington in the South London Qualifiers Final. The teams had representatives of our club along with players training at Ashford and Graham Spicers. Well done to Harshil and Arya and all others concerned. Wednesday 27 Sept 2017 and tonight sees the U.16 event. At present six teams have apparently entered so Hampton School are entering a B team to enable the competition to progress with two groups of three. Hampton have a reasonable team, but will be pushed by Turing House who have played in the regional competition at U.13. Richmond Park Academy will have some strong younger players who have come up through Barnes Primary school. Hampton School U.16 Richmond schools winners. There was quite a good turn out for the Richmond schools table tennis, although as usually happens a number of schools with good players were not represented. The winners were Hampton School beating Orleans due to their strength in depth. The Orleans Number one player was unbeaten but it went to the wire against the Hampton Number one. THANK YOU to Turing House for being so organised and displaying the date for the Borough Table Tennis MONDAY 10TH OCTOBER 2016. There has been an increase in the number of schools being represented at our club. Due to the London Youth Games we saw a few players from Richmond Park Academy coming along to train. In October this year there is likely to be a tougher competition between the schools if the schools enter their talented players. Turing House Boys have shown a keen interest and a few of the boys have shown good improvement. Orleans Park could still do extremely well with the players they have were they to enter. But of course Hampton School the hosts generally field reasonably strong teams. All will be revealed in October when the competition starts. Congratulations to Medha Verma and Morgan Wilkins on reaching the National Championships again this year. After a trying day of play Medha qualified in 4th place for the U.14 girls having won 3/5 matches while Morgan Wilkins qualified as an U.12 boy having won at least 11/12 matches. Well done to Medha of Latimer and Godolphin and Morgan of Christ's School for continuing the clubs history of success in having members playing in the National Championships for the last five years. The Richmond Borough Trial for the London Youth Games was a little disappointing in that only players from Our Club and Barnes Primary School turned up. We have hosted the trials at the club for several years now as generally the best junior players are members of the club, but there is always the chance that there are some we do not know about or who may attend another club. This certainly is the case with the players from Barnes Primary School who sent along two girls and three boys from yr6. who must rank among some of the best U.11's in the country. It was absolutely great that the two girls from Barnes Primary school came along as without them we would have found it hard to field a team. Both proved in matches with Medha Verma that they will be worthy representatives for our borough. The Boys selection also threw up some surprises Hardeep Dhaliwal a JBL player and Finlay Feil NCL Div 1 player clearly took the top two places for the team, but the reserve places went to Morgan Wilkins and the three boys from Barnes Primary School. Well done to all who took part, the level of play was extremely high and attitude and behaviour excellent. Richmond School's Championships were held at Hampton School last Monday 29th Sept 2014. With the absence of some of the Borough's top players due to school's not entering, at Keystage 4 Hampton had opposition just from Grey Court and Hampton Academy. Hampton's School's more experienced league players fought off all challenges hardly dropping a game. At Kytstage 3 there were eight entries with many tighter results. Hampton School A and B teams showed that they had strength in depth and a 4-4 draw when they met suggested that the new year seven pupils will be shortly challenging for places in the school team. Christ's school too had eight players all showing potential. Christ's older A team players were eventually outshone by the younger B team players led by Morgan Wilkins who went the whole tournament unbeaten. The only blip was when he lost one set to Jack Hawkins of Hampton before rallying to win the next two sets quite comfortably. In a closely contested final Christ's drew 4-4 with Hampton A but on countback they won 9-8. It was a great day of competition and hopefully those schools who dabble in table tennis will encourage their players to develop their skills to become better quality players. Well done to Hampton School on winning keystage 4 and Christ's A on winning Keystage 3. Archdeacon Cambridge is fast becoming the top junior school in the borough for table tennis. Theo Hainsworth has just succeeded in winning 7/8 matches in the recent National Cadet league for players U.15. Theo still being just ten years old will also soon be numbered among the 20 England ranked juniors in our club. With three other pupils attending the club regularly Archdeacon could field a team that would be a match for many secondary schools. Meanwhile Hampton School U13's won the plate competition for the South London Finals having won the Richmond schools regional competition. Heathlands School, represented by four players who attend our club, succeeded in winning the Hounslow school's U.16 tournament and went on to compete in the very tough West London area. The team of Alex, Rahul, Hardeep and Ismail played to their capacity but did not have the armory to challenge the top Greenhouse schools . For the second year running Finlay Feil of Orleans Park has qualified for the all England Finals in table tennis but this year in the U.13 age group, while failing to qualify in his own age group at U.12 finishing as 1st reserve..
Well done too, to Medha Verma who qualified to play in the U.12 and U.13's. 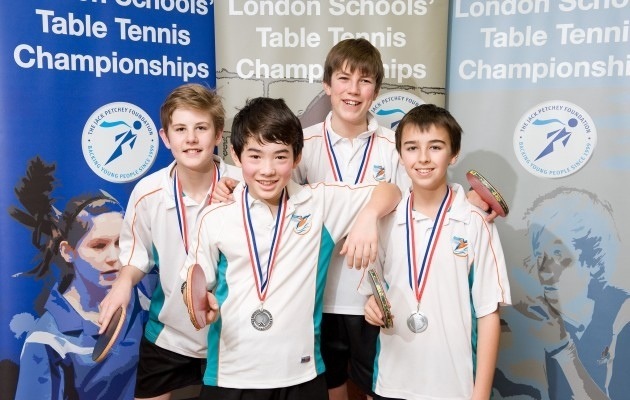 Jack Richards, John Barman, James Corner and Johan Smith of Twickenham Brunswick Club and Teddington School, won silver medal at the Jack Petchey South London Table Tennis finals having lost only two matches in the entire competition (both to the competition winners). They played with, a fantastic level of skill and sportsmanship throughout the day and are wonderful ambassadors for the school, the sport and Twickenham Brunswick Club. The All London finals are in the new year and depending on the outcome of the other regional finals the team may be invited to play in that. 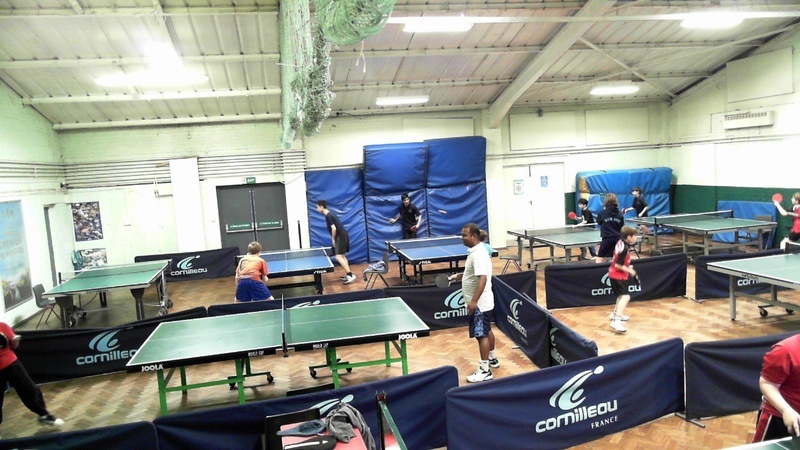 On Wednesday a number of the secondary Schools in Richmond upon Thames met to fight out the battle to be the top school in KS 3 and KS 4 for table tennis. It was good to see the numbers that turned out and there were a number of potentially good players as well as the more highly trained players who were members of our club. In KS 3 Greycourt came out winners overcoming Orleans who had Finlay Feil representing them and although being undefeated he did not have the supporting players to gain them the victories they needed. Greycourt also overcame Hampton School who fielded a squad of players that were potentially good enough to win the age group, but who suffered some narrow defeats. In the Keystage 4 section Teddington School fielded their strongest squad and their qualification was never in doubt. James Corner, Jack Richards John Barman and Johan Smith were generally far more experienced players and played with great committment. All have put in some serious training for the southern region competition attending club sessions and playing representative matches. Good Luck in the competition tomorrow Friday 30th Nov 2012. With the new ETTA ranking list out for the start of the new season Twickenham Brunswick now has 5 players ranked in the TOP 100 in the U.13 age group. Well done to James Corner 13, Hardeep Dhaliwal 70, Finlay Feil 71, Alex Rahbani 86 and Michal Papior 90. Congratulations also to David Rahbani, Charlie Rahbani and Rhiannon folan who are also ranked inside the top 100 of their respective age groups. Congratulations to all the squad on a great day and great performances at the 2012 London Youth Games. The girls team in a group of five came third, a highly respectable result as the winning team contained the U.11 and U.12 National Champion. Rhiannon Folan and Medha Verma will continue to represent the borough and no doubt improve in the next couple of years but thanks go to Caroline Cooper for her help and support for the past two seasons. The boys team also finished third, one place higher than last year again a very creditable performance as half of the team are still under13 years of age. Again thanks to the team for their support and understanding when it came to team selection, a crucial 3-2 win over Kensignton and Chelsea secured the third place and some extra points on last year. Well done to Alexander Gough, Jack Richards, John Barman, James Corner, Hardeep Dhaliwal and Finlay Feil. It has been another tremendous season for Richmond's schools table tennis players. Playing in the West London League against the top Table Tennis Academies and Greenhouse Schools: James Corner, John Barman, Jack Richards and Johan Smith. John Barman ranked 111 in England was in good form in Division 2. His contribution aided the team after a tough start losing 0-9 against West London Academy, to gain two wins 7- 2 and 6-3 against Harefield Academy teams. The Best in Richmond and Hounslow. Several players from Richmond and Hounslow Schools are now competing with the best that Britain can offer.at Table Tennis. Alexander Rahbani of St Michaels and St Martins is ranked 86 in the U.11's. John Barman of Teddington School ranked 122 shoul;d see his position rise dramatically after after 9 wins and just 2 defeat6s in the recent West Sussex Tournament. Well done to all the Twickenham Brunswick Players that are persevering to compete with some of the the top clubs and academies in the strongest region of Britain for Table Tennis. 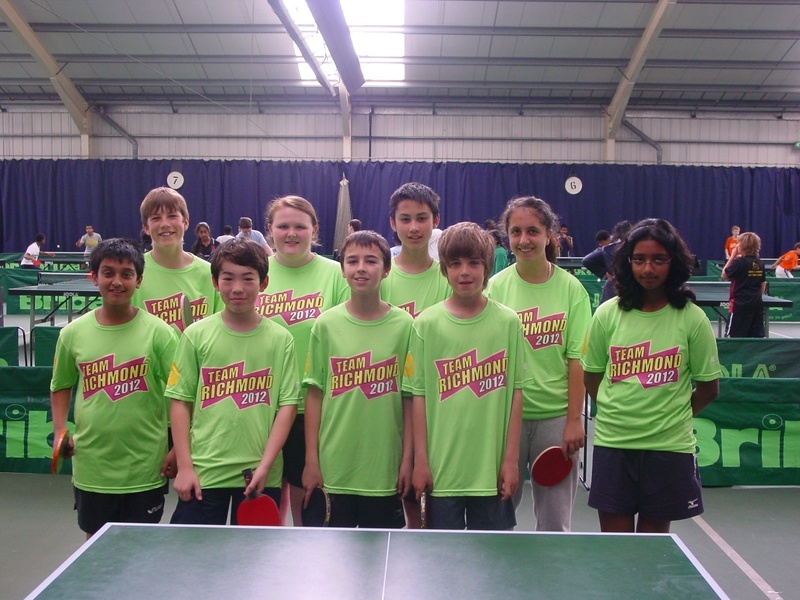 Well done to both the table tennis teams that represented Richmond this year. 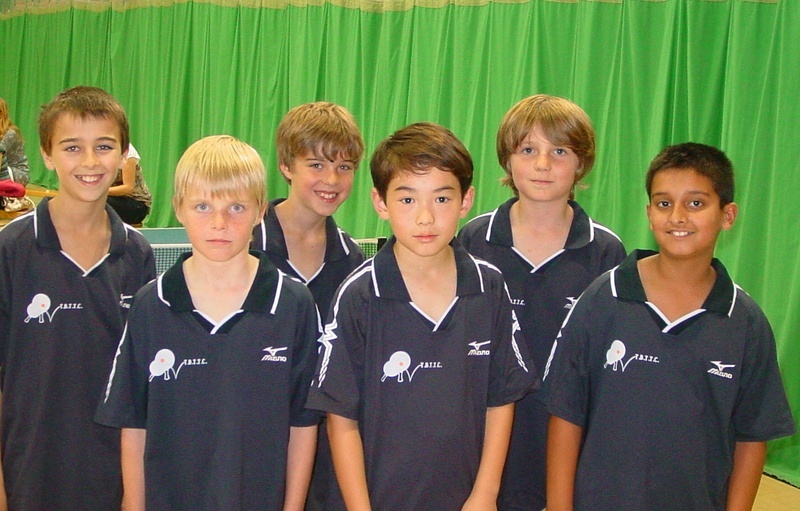 The boys team was generally very young with two players still in junior school and the other three in years 7 ,8 and 9. But well played, James Corner, Sachin Kumar, John Barman Finlay Feil and Jack Richards. Although the team won no games they were neither overawed nor out of their depth against some very highly England ranked players. The girls team though made a huge diference to richmond's overall performance, as it was the irst time for many years that richmond has been able to enter a girls table tennis team. The girls came 7th and was apparently the last result of the day that ensured Richmond upon Thames won the LYG title for this year. Well done Rhiannon Folan Mehda Verma Caroline Cooper and Harriet Corner. With four players taking part in the National Championships and many others that did not enter the qualifiers, the future looks bright for Twickenham Brunswick. Charlie Rahbani represented the club in the U.13 age group where he qualified from his group as runner up but met an inform Ben Holland in the first round of the knock out stage where he succumbed to a straight three game defeat. It is in the U.11s where our club excel Hardeep Dhaliwal found himself in a tough group which included Alex Ramsden The number 1 seeded player. Hardeep played as well as could be expected having taken up the sport just over a year ago, but lost all three first round matches.at present and three of the top 48 players in that age group were from our club. Alex Rahbani finished runner up in his group and after winning the first round match of the knockout stage, lost in the last 16 to Marcus Bracey in a very close match that went to five games. James Corner too progressed from his group and after a bye in the first round of the knock out beat his opponent when playing in the last 16. James then met Alex Ramsden in the quarter finals where he lost in three games but took the No1 seed to deuce in one of the games. The club is feeling quite buoyant after what can only be described as a most successful outing to the Nationals and is looking forward to competing at even higher levels next season when a number of our players will be playing in the BritishLLeague. Twickenham Brunswick have discovered their first really talented female player. Rhiannon Folan aged thirteen showed at the weekend what potential she has. There will have been a few surprised faces as Rhiannon took on four other girls in Middlesex and beat the lot. Rhiannon Folan a 13 year old girl from Twickenham Brunswick made quite a name for herself beating four other Middlesex girls all with higher rankings. Firstly she beat Samantha Lai ranked 27 in England at U.15, she followed that up by beating Rayna Bagchi ranked 51 in England she then went on to beat Sarah Whitehorn 58 in England and in the final topped her previous performances by beating Eda Aydin ranked 24 in England. Rhiannon is a pupil at Gumley School Hounslow, and a very promising Twickenham Brunswick player. James Corner has continued to make progess in the England table tennis rankings. The year 6 St John's School Pupil from Teddington has just secured 4th place in the U.11 rankings. With more points accumulated from the National Junior League and the recent U.11 London qualifiers, the Nationals and other competitions to come there is still a chance he may still rise higher before the end of the season. Another great achievement for Twickenham Brunswick. James Corner of St John's Shool Hampton Wick has qualifiesd to play in the National Finals for the U.11's being held in Doncaster in April. He qualified of right being ranked no.6 in England. Alex Rahbani a pupil of St Michael's and St Martin's Hounslow has also qualified to play in the National finals having won the London Regional qualifiers. Charlie Rahbani a St Mark's School pupil is also through to the finals for the U.13 having qualified inn the London regional play offs. Twickenham Brunswick therefore has three players playing in the National Finals this year, with Hardeep Dhaliwal being first reserve should any of the London squad drop out. James Corner of St John's School has just gained automatic entry to the National Championships in the U.11 age group. Congratulations to James Corner firstly on winning the Ernest Bevin 2* Tournament in the U.11 age group but secondly on gaining automatic entry to the U.11's National Championships by virtue of the fact that he is now ranked number 6 in England in his age group. With his recent string of wins in the National Junior League and in the Ernest Bevin Tournament we should see his ranking rising still further. This Tuesday 21st September 2010 A team of players who play at Twickenham Brunswick, but who are also the best Table Tennis players in Richmond Junior Schools took on Hampton Independent School's Under 13 team. A big thank you to the parents for taking the players and the school for organising the match. The outcome an honourable 5-5 Draw. Playing at No.1 James Corner, from St John's ranked 7 in England at U.11 beat Hamptons number one and two players. Joe Farren, of St Edmund's ranked 5 in England at U.10 laying at number two equalled James' performance beating both the Hampton players. Hardeep Dhaliwal of Nelson School, managed one win playing at number four while Fin Feil St Stephens, though competing in some outstanding rallies lost both of his games. After the singles the match stood 5-3 to Richmond U.11's but the two doubles matches that both went to the fifth set decided the outcome as Hampton narrowly won both. John Barman a guest player for the U.11's and Sam Reynolds of Collis School played in the reserve games gaining good experience for the future.